Haunted by the suffocating horror and hopelessness he witnessed in Haiti’s national prison, this artist finds solace in his work. Accused of arson, Paul Junior Casimir spent a year there, awaiting a trial that never was scheduled. He is one of the lucky ones; others have died waiting. Freed only because aid workers recognized his talent and a non-profit organization was willing to work on his case, upon release, Casimir began frantically building an art installation that recreates the hell he experienced. Casimir, 35, hopes the project, a traveling installation called “Enfermé, Libéré” [Locked Up, Freed] will draw public attention and help build momentum for change. The exhibition, which also includes photographs by Seyi Rhodes, was first displayed at the French Institute a few months ago. It is supported by the Haiti Bureau of Human Rights (BDHH), a non-profit organization made up of lawyers who provide legal aid to prisoners. Representatives of BDHH say the country’s main prison was never rebuilt after the magnitude 7.0 earthquake destroyed large parts of the city in 2010, but nonetheless it holds more than 4,000 prisoners, about six times its capacity of 700, even though some walls and ceilings are only half there. 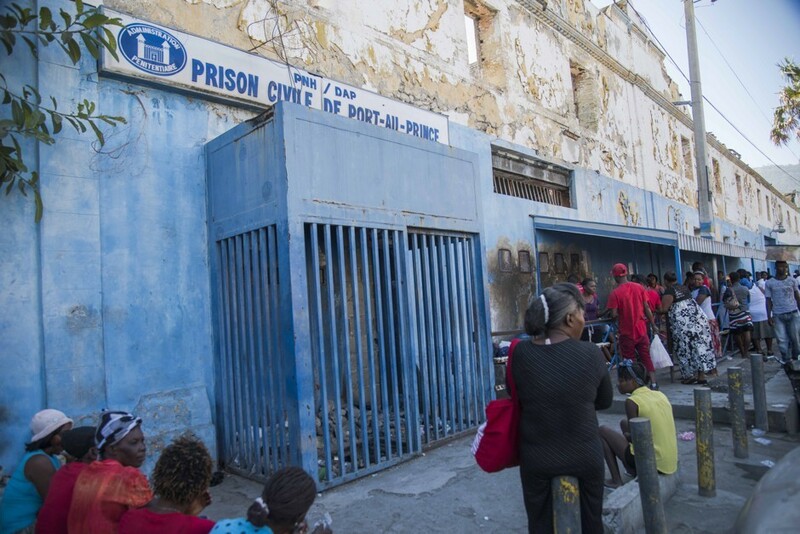 The vast majority—80 percent—are awaiting trial, according to the 2016 Survey of the Incarcerated Population of the Prison, a report commissioned by the United Nations Stabilization Mission in Haiti. Some prisoners already have been exonerated, but their files were lost, so they remain, said lawyers from BDHH. Most prisoners cannot afford a lawyer. If found guilty, many would probably be sentenced to a fraction of the time they already have spent in prison waiting to appear before a judge. Inmates die daily of diseases like tuberculosis and cholera, or malnutrition, according to the United Nations’ report. In Casimir’s installation, currently showing at Haiti’s national library located near the penitentiary in downtown Port-au-Prince, human-sized papier-mâché figures hold onto thin bars as they lay on tiny wooden beds. Pencil portraits and photos of real detainees hang on the walls; handwritten letters are pinned next to the puppets. They contain cries of despair of men and women, lost in the system and forgotten by the outside world. A year and a half later, on Feb. 8, 2017, Marcel died in prison—more than eight years after he was confined. He never got a trial, said Pauline Lecarpentier, the secretary general of the BDHH. He was buried anonymously in a collective funeral with other prisoners.